A reputed organization in the industry, we present forth a rich assortment of Event Stage Tent in the market. 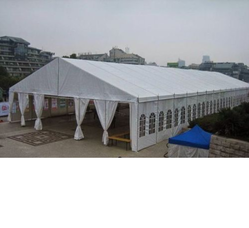 Our exhibition tents can accommodate almost each and every kind of occasion or activity. Be it a corporate event or a large exhibition, our tents provide an arrangement that render a sturdy, open-air facility to host it. Light in weight, these Exhibition Tents are easy to carry and install and are available in simple designs. Our exhibition tents are strong in structure and can encompass a large mass of people. These tents are very presentable and best for exhibitions. These are custom designed depending upon the client's requirement. Our exhibitions are available in various patterns keeping in mind the professional outlook. Our tents are easy to install and handling. 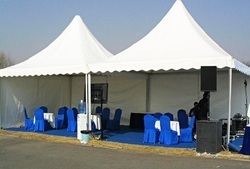 Our Exhibition Tents can accommodate almost each and every kind of occasion or activity. Be it a corporate event or a large exhibition, our tents provide an arrangement that render a sturdy, open-air facility to host it.